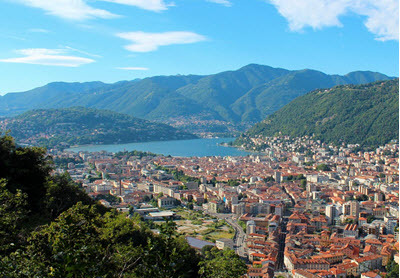 Como is a city and comune situated at the southern tip of Lake Como’s southwestern branch, roughly 40 km north of Milan. The city proper borders Switzerland and Como is very close to the Swiss towns Chiasso and Vacallo. Como was once world famous for its silk manufacturers, but is today heavily dependent on tourism. Its proximity to both Lake Como and the alps has made it a popular tourist destination, and Como has a lot of things to offer the visitor, including a rich history and a myriad of museums and cultural experiences. The city centre is very pretty with buildings from various epochs, including a town hall dating back to the Medieval era. Como was founded during the Roman era in 196 BCE. From a weather perspective, the best parts of the year to visit Como are spring and fall when the weather is neither chilly nor very hot. Spring can be a bit rainy, but no extremes. The summers in Como tend to be very hot and humid, sometimes oppressively so since windy summer days are rare. Sometimes a thunderstorm will sweep in to clear the air and lower the temperature a bit. The winters are short and not very cold. The typical winter weather is foggy and damp. Sometimes the Siberian anticyclone brings frost. There is no international airport in Como. Examples of international airports located within a reasonable distance from Como are Milano Malpensa and Milano Linate in the Milano metropolitan area, as well as Orio al Serio Airport outside Bergamo. It is also feasible to fly into the Lugano Agno airport in Switzerland and then cross the border by land into Italy. Travelling from Milano Malpensa to Como by car will usually take 30-45 minutes, while the trip from Milano Linate to Como takes about 60 minutes by car. Another (more time consuming) option is to take a shuttle coach or local tram from any of these two airports to Stazione Centrale in Milan and then go by railway to Como. If you land at Orio al Serio Airport, expect the trip to Como to take 1 h 45 min by car. It is also possible to take the shuttle coach to Stazione Centrale in Milan and then go by railway to Como. The Servizio Ferroviario Regionale (Regional Railway Service) connects Como to other major hubs in Lombardy and beyond. The two main railway stations are Como San Giovanni and Como Lago. There are also five smaller stations in Como: Albate-Camerlata, Albate-Trecallo, Como Borghi, Como Camerlata, and Grandate-Breccia. Como San Giovanni is frequented by a considerable amount of tourists since it is a stop on the main railway line between Zürich and Milan and Basel. Both Intercity and Eurostar stops at this station. Motorships and hydrofoils connect the city of Como with many of the villages scattered around the shores of Lake Como. Motorship lines run along the southwestern branch and northern branch of Lake Como, from Colico or Piona and the city of Como. The hydrofoils, locally known as aliscafi, are quicker than the motorships but also more expensive. They are available for more or less the same routes as the motorships. There is a local public bus network (ASF Autolinee) consisting of both urban lines and extra-urban lines. The extra-urban lines connects the city of Como with most of the other population centres in the Como province. The urban lines will take you to various locations within the city. There are special bus lines (Ferrovie Nord Milano) connecting Como with Varese. These buses run instead of a discontinued railway line. The Como – Brunate funicular will take your from Como to the little mountain village of Brunate, approximately 715 metres above sea level. The water aerodrome and seaplane base (“Idroscalo”, ICAO code LILY) in Como is chiefly used for flight training and local tour flights. It is home to an aeroplane club with its own fleet of seaplanes.